COMMON NAMES: Giant moray, Indo-Pacific giant moray. DESCRIPTION: A large moray. Brown to greenish brown with small irregular black flecks. Small black blotch over gill slit. RANGE: Red Sea and East Africa to Japan and Hawaii. All of the images on elasmodiver.com are copyright protected. 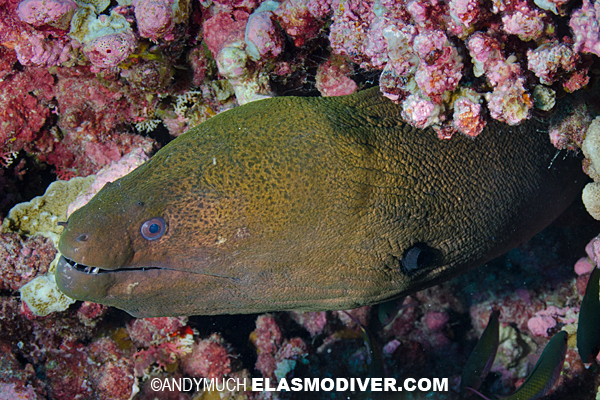 No unauthorized use of these Panamic Green Moray Eel pictures is permitted. Please contact Elasmodiver for further information.